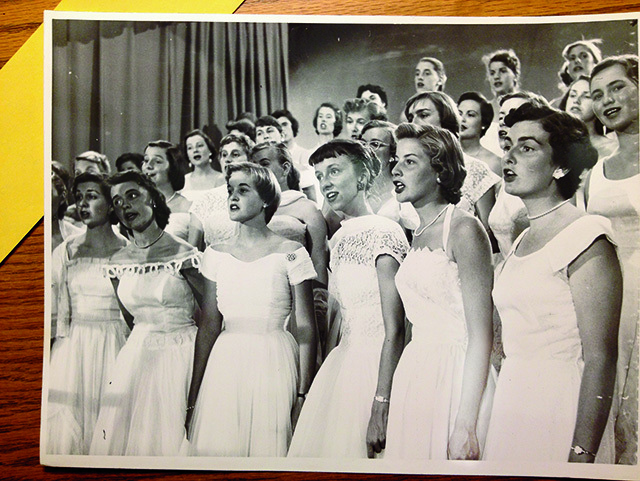 The Smith College Chamber Singers, circa the 1950s. Smith College was still young in 1885, when a group of 14 students in Hubbard House gathered after dinner to sing. 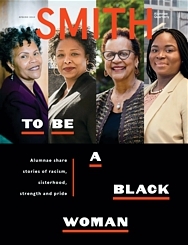 In short order and in proper Smith fashion, they gave themselves a name (the ’88 Glee Club), elected a leader (Ann Short 1888), secured a practice room in Music Hall and began adapting songs from the Yale Glee Club book, when no songbook for women’s voices could be found. The group eventually morphed into the Glee Club, the premier singing ensemble at Smith. Over the years, choral groups have come and gone, changed leaders and revamped repertoires. No longer do classes have their own choruses, for instance, as they once did. Performance standards have remained high, though, and the music just as challenging. “The enthusiasm has stayed the same,” said Jonathan Hirsh, director of orchestral and choral activities for the past 18 years. Indeed, students in Smith’s various choral groups—whether the Glee Club or a student-led a cappella group—practice for four to six hours a week, a rigorous extracurricular commitment that leads to lifetime friendships. Here’s a look at Smith’s current lineup of ensembles. Smith Chorus: The gateway choral group at Smith, its focus is on first-years but it is open by audition to all women in the Smith community. Conducted this year by Joseph Baldwin, the chorus performed a commissioned work last fall for women’s voices by Dominick DiOrio. Glee Club: The largest and oldest of Smith’s choral groups, the club is open to upperclass students by audition. The group sings at major college events and travels to other colleges. Each spring, it invites a male glee club from colleges like Harvard and the U.S. Naval Academy to collaborate on a major work, such as Carmina Burana or Beethoven’s Ninth Symphony. Alumnae Chorus: Alumnae organized themselves informally in 2001 as a Chamber Singers reunion tour of Europe, led by Jonathan Hirsh. In 2010, alumnae singers gathered for another tour, which led to the creation of an official Alumnae Chorus that in 2013 performed in Estonia and the Baltic States. “It’s music and sociability and alumnae connections all wrapped up together,” says Caroline Winschel ’09, vice president of the chorus. Smith’s vibrant and competitive a cappella scene kicks off each fall with Arch Sing, when the groups showcase their style in a bid to attract new singers. Auditions follow, with hundreds of students vying for a few open spots. A cappella groups hold their own campus concerts, featuring a mix of contemporary pop and old standards, and they travel to other schools as part of a network of collegiate a cappella groups. Most also sing for hire at events on campus and off as a way to raise money for recordings and travel. Check out their websites or Facebook pages for performance updates or new recordings. The Noteables Founded in 1982, it was the first campus group to use the now ubiquitous vocal percussion. Navy blue is their color. Old favorite: A jazzy take on “I Want You Back.” New favorite: “Riptide” by Vance Joy. The Vibes Last year, the group, which got its start in 1995, performed in their trademark black and pink at the MTL a cappella festival in Montreal. Old standard: “Sweet Dreams” by the Eurythmics. New favorite: “Miss Independent” by Ne-Yo. Groove A Cappella Founded in 2001, Groove is the only group affiliated with the music department, and its members are drawn from the Glee Club and Smith Chorus. They wear black and white in concert. (Official food? Oreos.) Favorite current song: “Breezeblocks” by Alt-J. Old standard: “The Parting Glass” (traditional Irish).